This Gingerbread Village at the Sheraton Seattle Hotel is all the Star Wars! The Force is strong with this year’s (23rd) Gingerbread Village at the Sheraton Seattle Hotel. It’s all Star Wars! 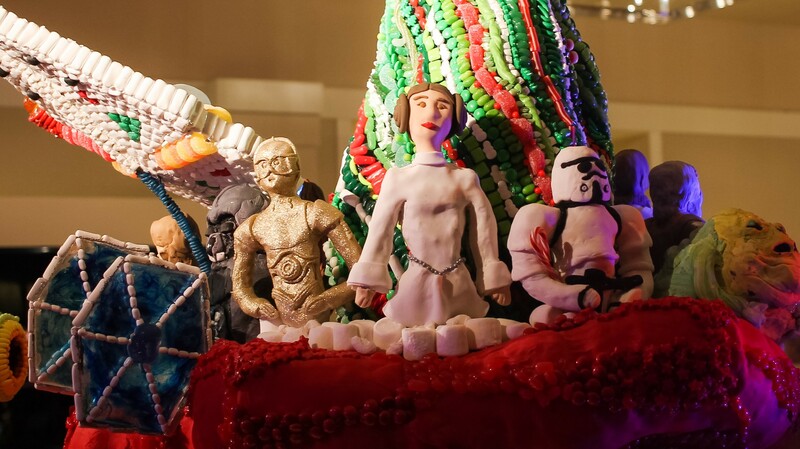 Pictured below, are huge Star Wars movie themed displays with exteriors made mostly out of reinforced gingerbread, frostings, candy bits, lots gummies, and a gazillion other sugary bits and bites. Each display developed from the work of an architecture firm and lead “chef.” Also involved were children (aka “Elves”) dealing with Type 1 Diabetes, promoting the cause of the Juvenile Diabetes Research Foundation (JDRF) for treatments and research. For those who wish to visit, it’s located near the Washington State Convention Center in Downtown Seattle, the Sheraton hotel. The Gingerbread Village is free to the public until January 3rd, 2016. You may also donate money to the (JDRF) Northwest Chapter. For more site and event information (and donation info), click here.